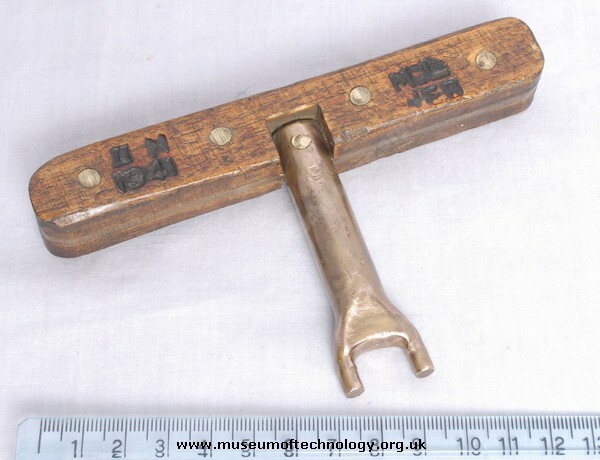 Home: Shells and Grenades: WW11 KEY FOR OPENING AMMUNITION BOXES. I don't think either of these two similar objects are for artillery fuze setting, at least in the 20th Century. The size is wrong, the shape is wrong and the metal is wrong for a fuze setter. Brass suggest use in an environment where sparks have to be avoided, the size and shape suggest a tool for unscrewing primers from an artillery cartridge case.